Lock in a great price for Holiday Inn Bern Westside – rated 8.4 by recent guests! Location to public transportation and helpful staff. The receptionist who checked us in was extremely helpful with luggages. Friendly staff! Very accommodating and made us feel at home. Train station is so easy to get to from here and the breakfast was delicious! It was great. Very easy to find. The room was very comfortable. Located right next to the tram and train so you can easily go to the city center through public transportation since taxis are super expensive there. Also a big mall with loads of restaurants/food court is right next to the hotel. Location was great with direct connection with the westside shopping mall. Rooms were clean and allocated parking for hotel guests shared between the hotel and shopping center was very ample and convenient. Breakfast was satisfactory and was pleased that breakfast service was available until 11am. Rooms were clean and comfortable. Holiday Inn Bern Westside This rating is a reflection of how the property compares to the industry standard when it comes to price, facilities and services available. It's based on a self-evaluation by the property. Use this rating to help choose your stay! The Holiday Inn Bern-Westside is located in the new district of Bern-Brünnen, just an 8-minute train ride from the Bern Main Station. 3 hours free access to the Bernaqua Adventure Pool and Spa and a ticket for public transport are included. All rooms are air-conditioned and offer free WiFi. The hotel is part of of the Westside Shopping Center including a food court, a cinema and sports facilities. The Shopping Center was designed by the world famous architect Daniel Libeskind and is located in scenic green surroundings. All rooms at the Holiday Inn Bern Westside are air-conditioned and feature free WiFi. A lounge bar and a restaurant with a terrace are available, where guests can enjoy fresh local cuisine, as well as assorted Toblerone desserts, as the Toblerone factory is close by. 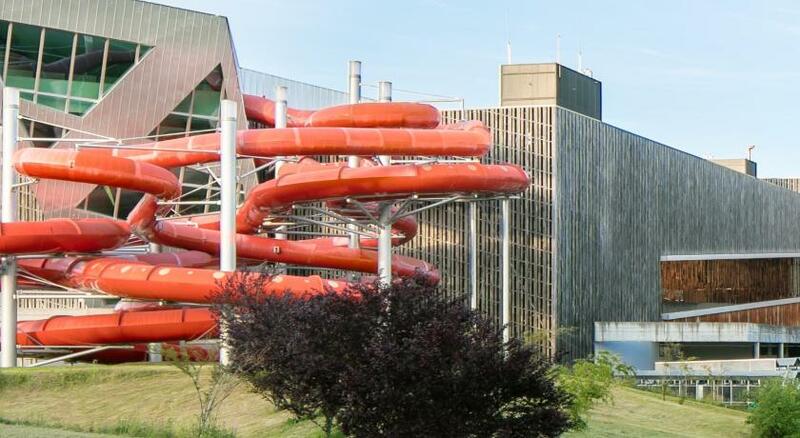 When would you like to stay at Holiday Inn Bern Westside? Air-conditioned room with a flat-screen TV and a tea/coffee maker. Please note that bed types are subject to availability and have to be requested upon booking. Air-conditioned room with a flat-screen TV and a tea/coffee maker, overlooking the surrounding countryside. Spacious, air-conditioned room with a king bed, a flat-screen TV, a Nespresso coffee maker, and free drinks from the minibar. It offers panoramic views of the Bernese Alps or the Jura countryside. House Rules Holiday Inn Bern Westside takes special requests – add in the next step! One child from 12 to 18 years is charged CHF 30 per person per night in an extra bed. Holiday Inn Bern Westside accepts these cards and reserves the right to temporarily hold an amount prior to arrival. Please note that on the day of the arrival, the booking confirmation is also valid as a public transport ticket, including a transfer from Bern Airport. Receptionist during check-in and when obtaining wristbands for the waterpark was less than friendly. We were required to leave our room key in exchange for the wristbands, which was not required of a couple checking in before us and was a bit mind-boggling. Comments were exchanged between her and the coworker which did not strike us as being friendly or welcoming. It was difficult to find the operating hours of the swimming pool as well as the location. The hotel should be more transparent that the swimming pool is not part of the hotel. Disappointed no mini-fridge for mini-bar in room. It was pretty much as expected, so everything was actually OK. The hotel seems to have a problem with ensuring proper training of all the staff who are in contact with its customers, especially in the breakfast room, where a young staff member was unfamiliar with the basic rules of courtesy and politeness. Friendliness and service orientation seems to be more a matter of choice left to individual staff members than a policy of the house.Holiday Inn may benefit in the longer term from changing this and investing more in its staff. Efficient and friendly staff at reception. Very clean and functional rooms. Excellent access to public transportation. Unfortunately, we arrived in winter and the room was not able to heat up satisfactorily. The thermostat was about 23-24 degrees, but it was not enough after a full-day visit to the frozen city. In addition, the windows were at most 20 degrees. Staff showed us how to raise the temperature, but it did not. Nor did anyone deal with it. Honestly - in such a good hotel, it's quite a shame. Breakfast was good, but it was not surprising. The room is furnished functionally, but a bit unobtrusive. Excellent location near highway, good parking - paid - great internet connection. The hotel is located right in the shopping center. There is a tram alongside the hotel, but the rooms are quiet. Excellent restaurants offering specialties. Ideal place to visit Bern, but also other cities of central Switzerland. Staff in the restaurant looked little stressed which we felt during the breakfast. Would have appreciated if more information about Bern is available at reception. Excellent location well connected to city by tram train and bus. Nice rooms and facilities. Breakfast was good. The bed was so comfortable. The bath very clean. Private parking and free access to Bernaqua was top. We asked for single beds and they give us duble.. the room was very small.